Is India a tariff king? Mumbai: Earlier this month, US President Donald Trump described India as “the tariff king", accusing it of imposing “tremendously high" tariffs on American products. As if to prove him right, India last week introduced a second set of tariff hikes. While the recent tariff hikes may have been occasioned by the burgeoning current account deficit and the fall in the rupee, they only reinforce a growing trend of protectionism in Asia’s third largest economy. While import tariffs may provide the economy with short-term relief, left uncorrected, the country’s lurch toward protectionism could extract a steep price in the years to come. Already, India is among the most heavily protected economies in the world, a Mint analysis shows. And if tariff hikes continue, the “tariff king" title could stick. In order to compare the rate of protection across countries, we use the “effective average tariff rate" here instead of a simple average of tariffs. This is because a simple average of tariffs across different products might not reflect actual trade patterns and, hence, may not correspond to the tariff walls exporters actually face. 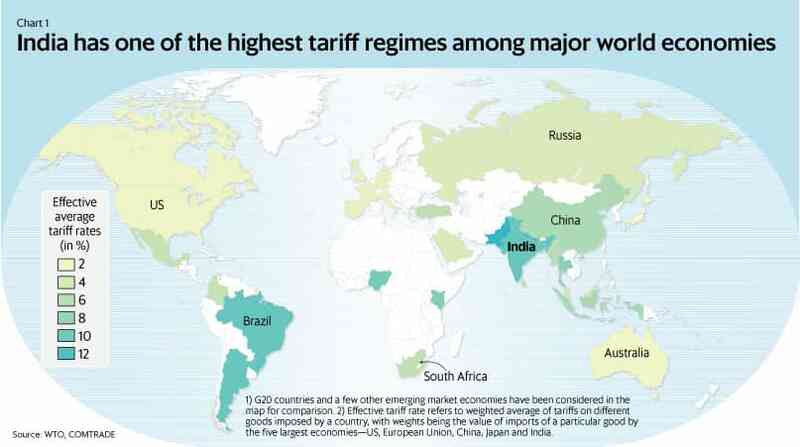 In this analysis, the effective average tariff rate imposed by each country has been calculated as a weighted average of tariffs on different goods, with the weights being the value of aggregate imports by the five largest economies of the world—the US, EU, China, Japan and India. The analysis assumes that trading patterns of most large economies resemble those of this aggregated mega-block, accounting for 70% of the world’s GDP. No wonder then that it was not just Trump who was complaining about India’s trade policies. A recent World Bank report accused India of increasingly resorting to trade remedy measures such as anti-dumping and safeguard actions. According to the report, between 2011 and 2015, India initiated around 10% of global anti-dumping investigations and 17% of new safeguard investigations. The lurch toward protectionism is especially worrying because it threatens to undo more than two decades of trade liberalization measures that have powered India’s growth over the past quarter century, boosting incomes and helping cut poverty levels. “…While protection succeeded in creating a large and highly diversified industrial base, it led to inefficiency in the use of resources," said a 1993 National Institute of Public Finance and Policy paper on the evolution of India’s tariff policies authored by Bishwanath Goldar and Hasheem N Saleem. Trade liberalization fostered an atmosphere of intense competition, leading to better use of inputs and innovation, driving productivity growth. Data from the Reserve Bank of India’s KLEMS database show that India witnessed a productivity boom after liberalizing trade in 1991 (chart 4).